Dr. K.P. Yohannan, founder of Gospel for Asia, reflects on how the Lord has gone before the ministry both on the field and in the supporting offices over the years. As Gospel for Asia approaches its 40th anniversary next July, can you tell us about some of the unexpected ways you’ve seen the Lord go before the ministry? When my wife and I first started Gospel for Asia, we had no idea to what extent the Lord would use it. All we had was this one all-consuming passion: to bring the love of Christ to the neediest and hurting people in our generation, and to do it in the most effective way possible. Looking back, I am constantly amazed with all the Lord has done and is doing through this ministry. Year after year, we see massive amounts of literature distributed that are filled with messages of hope for the hopeless. We’re able to help provide medical services to remote villages, water filters where there is no clean water, and items from the Christmas Gift Catalog to help needy families earn a living. When we first began, all we had were a few brothers and sisters visiting homes to encourage and pray for people. Now, as I look around at the children being rescued, the widows being cared for, the illiterate being taught to read and write, and so much more, I am overwhelmed. It’s humbling to witness all the ways in which Lord has led us. Just think about it. 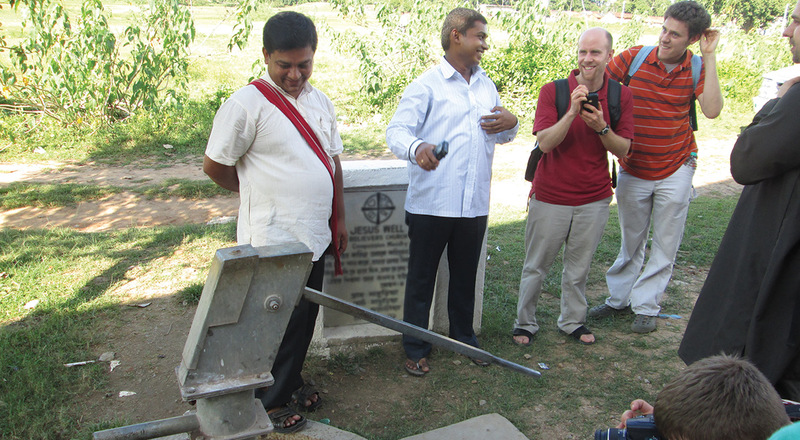 Last year alone, we were able to see more than 4,000 Jesus wells installed for villages without access to clean water. More than 300,000 mosquito nets were distributed in places where people are sick and dying of malaria. Vocational training was provided to more than 10,000 struggling women so they can now make a living. More than 50,000 illiterate adult women were taught how to read and write, which means they can now read God’s Word. And this is only a partial report! What a joy we have been given to play a small part in each one of these stories. Can you share one of those stories with us? Earlier this year, I was in the slums of Bombay, where I met a lady who had faced the unbearable crisis of whether to sell herself into the red-light district as a prostitute or allow her two little children to suffer. 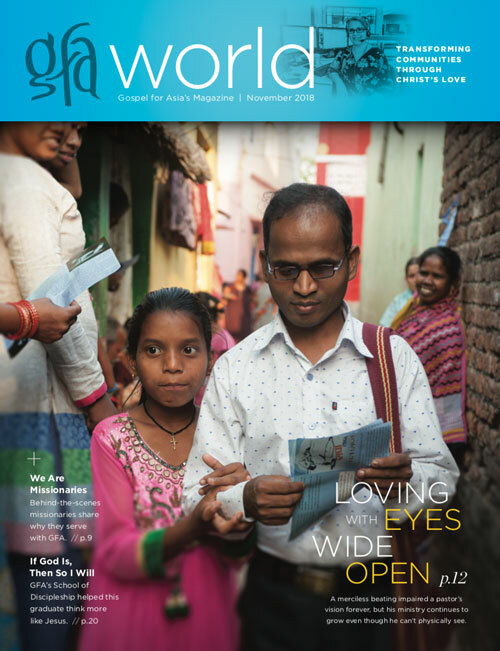 It was in the middle of her agonizing decision when she met two Sisters of Compassion, specially trained women missionaries, who were serving the Lord in that slum. By God’s grace, the sisters were able to help her by providing vocational training and a sewing machine, so she could start her own business. Her children were enrolled in a GFA-supported Bridge of Hope center, where they are now receiving an education, a daily nutritious meal and so much more. It sobers me to think that her story could have had a completely different ending. And you know, it was all because someone she had never met was out there praying and supporting GFA. Stories like this one cross my desk day after day after day. I wish I had time to share them all with you. How has the growth on the field impacted the supporting office? We have found, as we continue to grow, that what has worked to help us be the most effective in one season is different than in another. Since Gospel for Asia first began, we have constantly tried to follow God’s leading in all we do. Even when He guides us in ways we may not expect, He always remains faithful. One of the ways the Lord has led us recently is in the area of our 100 percent practice. From the very start of our ministry, we have maintained a tradition of sending 100 percent of funds preferenced for any field project to the mission field. This practice is something we all felt good about doing. But at this point in our history, this practice—which worked well when we were small—feel has begun to hinder the growth of the work rather than help it. Over the past five years, there was a growing awareness amongst our leaders that this practice had begun limiting our growth in meeting ever-increasing needs and opportunities to minister the love of Christ to the multitudes. Much prayer and seeking the Lord was involved as we looked at this change. After time to think and pray through it, our Gospel for Asia Board of Directors advised us that moving away from this practice was important to continue to be as effective as possible. This shift means a small percentage of each gift designated for the field is used to help meet the various administrative needs and expenses required to function efficiently. As usual, the percentage used will be accounted for in our annual reports. This practice is the predominant method for most other ministries, but it is something new for us. What is one way this will help GFA to become more effective? One of the ways this next step will help us be more effective is by giving us the opportunity to have newly accepted staff join us right away. Traditionally, we ask new staff to raise their own support before they join us. However, this process can sometimes take months and even years before they are able to come, which means, for an extended period, we are without the much-needed help to move the ministry forward. Every individual who serves in our supporting offices represents more than 100 workers on the field. Having a portion of funds available to support these behind-the-scenes missionaries means new staff can join us sooner, and we have the possibility to help more people in Asia be rescued from poverty and be transformed by the love of Christ. This is nothing new. Look at the book of Acts. Paul and Barnabas didn’t just set out to do ministry on their own. They were sent by the entire church of Antioch, who stayed back to collect resources in order to support them. Or look at the Moravians, a people who were passionately committed to the Great Commission. In a group of 10 families, they would choose one family to be sent while the rest of them stayed behind to pray and support them. Every missionary story is like this: Adoniram Judson, Hudson Taylor, William Carey, etc. If one person is sent, a dozen more are behind the scenes holding them up. This is the Body of Christ—each part faithfully playing its role. What do you see when you imagine GFA in the days ahead? One verse from the Gospel of John plays in my mind over and over: “The night is coming when no one can work” (John 9:4). Our opportunity to take the Good News of hope to the world is getting shorter. There are nearly 2 billion people who still wait to hear there is a God who loves them. For all of us at GFA, this is a very big motivator. When we first started this ministry, we had no idea all the ways the Lord would call us to be part of touching the lives of so many in Asia. If you had asked me when I first committed my life to serve the Lord at age 16 where I would be at age 60, I never could have dreamed it would be where I am today—not in a million years. And I know the same is true today. I don’t know what the future holds. I don’t even know what tomorrow holds. But I know the Lord is faithful. I know His heart is to pour out His love on the nations. All I can tell you is I am like a little sheep following my Master’s voice. My only desire is to walk with Him wherever He might lead. I am excited to see where these next 40 years will take us. And I am grateful for you and all who are very much a part of this incredible journey the Lord is taking us on. INDIA – In August, GFA-supported workers living and serving in Kerala, India, braved flooded streets and homes to rescue hundreds of stranded people after monsoon rains escalated into the worst flooding in nearly a century for that south Indian state. Workers rode in high-rise tractors and traveled in boats to remote regions, providing immediate aid to people in desperate need of help. At relief camps, they partnered with the government to distribute water, food, mats, buckets, sanitary napkins, toothbrushes and many other items to people waiting to return home. Dr. K.P. Yohannan, founder of GFA, was on the ground during this natural disaster, distributing supplies into the hands of grateful people who had lost everything in the flooding. Seeing the urgent need, hundreds of people around the globe worked together to offer aid. Because of their compassionate hearts, men, women and children in Kerala received the help—and hope—they need to rebuild and restore what has been lost. To read more about the flooding and to take part in the on-going relief efforts, visit the Kerala Floods 2018 page. ASIA – GFA-supported workers are actively living out Jesus Christ’s compassion to those around them by feeding those who are hungry. On World Humanitarian Day, Aug. 19, workers in one region of Asia prepared and distributed food to men, women and children living in slums and to outcast widows. Many of those whom the GFA-supported workers met that day earn their living by collecting honey or making plates from palm leaves to sell in the markets. The widows, on the other hand, beg—the only “profession” allotted to them because of their circumstances. Samaya, a widow, gratefully received the gift of food. GFA-supported workers extend Christ’s love to the “least of the least” in their societies 365 days a year, especially observing internationally recognized days to serve as His hands and feet. Read more stories of GFA-supported workers ministering to people on special days at https://gospelforasia-reports.org/. USA – July 3, 2019, will mark 40 years of God’s faithfulness in using the ministry of GFA to administer hope and help to the people in Asia—and GFA staff across the globe are excited to celebrate this special anniversary. Yohannan and his wife, Gisela, never imagined they’d see the Lord impact so many lives through their fledgling ministry in 1979. What started as a burning passion to share Christ’s love has grown to see more than 3.5 million people now worshiping the Lord, along with countless others who have experienced His love in word and deed. However, there is a growing sense that GFA is at the cusp of an even greater move of God. As staff reflect on GFA’s history, they excitedly look forward to the future, believing 2019 will be a time to move forward into a new era of passionately sharing the love of Christ. Join GFA in celebrating God’s faithfulness throughout 2019! Exciting changes and transitions are ahead, and we hope you can help us make 2019 a year of seeing God move in significant ways. Jasmine squatted by the water buffalo while her fingers deftly milked the gentle beast, keeping a steady stream of milk filling the pail underneath. She smiled, thinking about this new gift and the future that it will provide. Jasmine, 40, grew up in poverty. When she was a child, the opportunity for an education slipped through her fingers while she worked to provide a little extra income for her parents. When she was 17, she married, but poverty only followed her. In the course of their marriage, she and her husband had four children, but sickness plagued their family. One after another, they each would fall ill. Jasmine and her husband visited hospitals, and when that did not bring healing, they turned to witch doctors. All the while, the little money Jasmine’s hardworking husband earned as a laborer depleted. But there was one thing that gave Jasmine hope: Jesus. After meeting a GFA-supported worker, Jasmine discovered Christ’s love, and her heart beat with living peace. Healing, restoration and happiness entered her life despite the mounting financial difficulties. Then, one tragic day, she received life-changing news. After working an evening shift at a construction site, Jasmine’s husband was found dead the next morning with no known cause. Now Jasmine carried the family’s financial burdens entirely in her hands. But she had Jesus and the fellowship of believers around her to console and encourage her. Four years passed, and Jasmine labored to take care of her growing children and to make sure they received the education she never did. Then, in 2015, as Jasmine clapped her hands and worshiped alongside believers inside their church home, she and thousands of others across Nepal felt the ground shake under the rumblings of what was one of the most devastating earthquakes in the country’s history. Even though the epicenter of the quake was about 24 miles away, it destroyed her house and everything inside. She was left with nothing but rejoiced that her life and her children were spared. The government provided her with tin sheets so she could create a shelter for herself and her family, but she was left crying out to God for more help. The Lord, in His love and grace, saw this widow’s pain and the weights she carried. Using His servants as His hands to administer comfort, He provided Jasmine with a water buffalo—a gift that would provide her with a reliable income in the days and months to come. As Jasmine’s hands milk and care for her new gift, her heart fills with hope. Her children have food and an education, and one day, she will be able to build a sturdy house with the income she will get from selling both the buffalo’s milk and its calves. 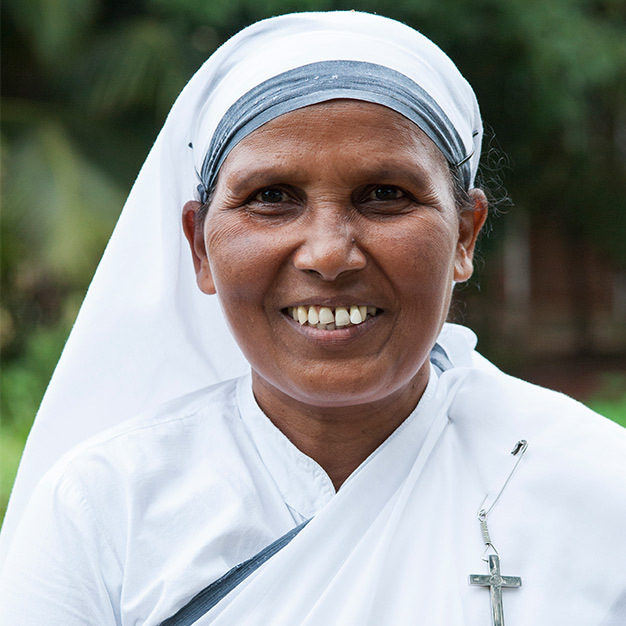 Amala served as a Sister of Compassion among widows. Here she shares about her ministry and faithfully serving the Lord. What motivated you to become a Sister of Compassion? [Before I was a Sister of Compassion], I saw many orphaned children and widows, and no one was there to take care of those people. When I saw their condition, I felt there might be someone to take care of them. Then the Lord opened the door for me, and I joined the Sisters of Compassion. Through this ministry, I believe I can serve the poor and needy people of this society wholeheartedly. In what ways have you helped the poor? Many times, when [the widows] didn’t have the medicines for their sickness, I would get the medicines for them. I also used to give them money to buy rice; I used whatever money I had and helped them to provide for their daily needs. … Not only that, I was able to help the small children. There were parents who were not able to pay their children’s tuition fees, so I taught [their children] free of cost. … Whenever [families] had problems, they would come to me, and I would help them and encourage them. If anyone was sick in the family, they came running to us and shared with us their problem, and we would pray for them. What training did you receive, and how has it helped you? I studied so many subjects during my training period [to be a Sister of Compassion]. I [studied] child psychology, pastoral care and counseling, personal development, missionary biographies, health and hygiene, first aid, English, and many other different subjects. … But one thing that really helped me was when I learned tailoring. After my training, I went back to the mission field, and there I got the chance to teach the sisters of those villages how to stitch clothes, so they could earn a living for their family. In what ways have you seen the Lord impact people through your ministry? We started our ministry among the widows, and I spent most of my time with them as they were helpless and hopeless. There was no one to help them, and sometimes they shared their pain with us. … We used to give them comfort, and I used to tell them that we don’t have anything to give … but one thing that we can give you is the love of Christ. So most of the time, I would sit with them, encourage them, motivate them and comfort them through God’s Word, and they keenly listened to whatever I told them. Every parent has a dream that their children will marry and have a settled life. But for me, I don’t think about those things. … All those things are secondary. I have completely sacrificed the family life and all those desires. … I committed my whole life to the Lord’s ministry, so I pray that as long as I can, I will serve the Lord. Pray for my ministry. During my ministry I may face many difficulties; pray that God might help me to overcome all those hurdles and serve Him in more effective and efficient ways. Andy, GFA staff member and current director of communications at GFA’s international office in New Zealand, shares about how God uses the weak and foolish to change lives. Serving with GFA has been one of the greatest blessings of my life! When we step back and see the Lord’s hand upon GFA, there isn’t really much we can do except boast in the Lord. God calls the weak and foolish (1 Corinthians 1:27). Many of us would not meet the requirements of the world or even some ministries. I took a Bible course once and failed my tests because I wasn’t able to remember the names and details in my head no matter how much I tried. Thankfully, God looks at the heart and looks for people who are willing to do things for Him even if they are not qualified. We have the example of King David, who was overlooked by man’s standards, yet God specifically chose him to look after His people, Israel. There are times I find myself saying “I can’t do this,” or “I don’t have the experience,” and it causes me to look to the Lord. Recently, the Lord reminded me of my time spent traveling in Asia. As I was walking through the streets of a large city, I saw a little girl about the age of 2. Her head was lying on the cement with closed eyes, no pillow, and she was not properly clothed. Glancing around, it appeared she had no one to look after her. I have wondered, Did that little girl make it? Has she ever been shown love? Has anyone ever been able to reach out to her and give her hope? Someone somewhere in the world was willing to give up their temporal earthly treasures so those children could have a hope and a future. I am so thankful to the Lord for our GFA family around the world who have “given a cup of water” in Christ’s name. They are real heroes who are literally helping to save lives. Ranjay shivered as he rolled out of bed. He decided he wouldn’t wash his face or brush his teeth that morning; the icy water would sting his already chapped lips and shock his dry, cracked face. The young man knew he had to go outside to face the all-consuming cold that day. Wrapped up in every warm shirt he owned, Ranjay stepped outside. His breath made a giant cloud of steam in the air as he performed his morning chores. Later that day, he quivered in the classroom as he tried to keep his hands from freezing stiff, but they hurt and trembled from the frigid temperatures. It was winter—a fierce season that was no stranger to Ranjay—but he didn’t have the warm clothes he needed to shield him from the freezing climate. Ranjay and the other young men around him felt a passion to proclaim the goodness of Jesus. But in the winter season, it was almost impossible for these Bible college students to travel the mountainsides to share Jesus’s story, because they would often catch cold from the extreme temperatures. Huddled around fires or snuggled together under blankets, most villagers in the Himalayan region waited until the sun was fully out to begin their day. It was just too cold to work, and many of them lacked warm coats to protect them from the nippy air. Ranjay and his brothers in Christ knew, because of how the community often gathered together to keep warm, this was the perfect time of year to share the Good News and the hope of Jesus. So they went—despite the weather. God knew about the needs of his sons. He knew even before prayers for warmth were offered up to Him. Across the globe, the Body of Christ gave, some out of their abundance and some out of their meager incomes, to provide for the shivering who had no means to buy warm clothes. One day, Ranjay’s needs were met as he opened his hands to receive a gift that brought joy to his heart: a new, thick winter jacket. Ranjay has renewed enthusiasm in his service to Jesus now that he is properly clothed. His encouraged heart now encourages others as he shares the story of how God provided a jacket for him. “After receiving this jacket as a gift, it is wonderful for me because it gives me joy and moreover it gives me strength to face the cold,” Ranjay said. There are many brothers and sisters like Ranjay who are faithfully serving Jesus no matter what temperature it is outside. In many regions in Asia, winter is severe and can cause sickness and a lot of discomfort—even causing a hiatus in ministry on extra cold days. We can ask the Lord to keep our brothers and sisters warm this winter and that He will provide warm clothing and blankets for national missionaries and needy villagers. Pray that this winter, many will experience the warmth of God’s love as GFA-supported workers share God’s redemption story around village fires. Throughout the ages, people have asked: Where did I come from? Why am I here? Where am I going? We find the answer in the words Jesus used to recruit His future disciples. Jesus’ simple statement, “Follow me,” sounds like He just called these fishermen to become workers for His ministry. But He had far more in mind when He spoke those words. He meant: Follow Me and be the extension of My life. I will be leaving you after a short while, and you will need to continue this journey to represent the Father to this world just as I did and complete the work I started. We get a glimpse about the journey Jesus took in Revelation 13:8: “The lamb that was slain from the foundation of the world.” It speaks about God Almighty coming to earth as a man to walk among us, so He could shed His blood as a sacrifice for the sins of the whole world. This verse stretches from eternity past to eternity future. The sacrifice for our redemption was completed on Calvary, and the victory was proclaimed on Easter with the resurrection. The part of the journey left for us to finish is to become fishers of men and to proclaim the Gospel to all nations. All this means is that we are to live for another world—while we are still here on earth. The Apostle Paul expressed it this way: “Seek those things which are above, where Christ is, sitting at the right hand of God. Set your mind on things above, not on things on the earth” (Colossians 3:1–2). During the first century, many believers expected Jesus to return almost immediately. Their hearts and emotions were so “gone” to that other world that they had to be reminded to work and make a living while they were waiting for Christ to take them there. More than 2,000 years later, we are so bombarded with a million things of this earth, which is passing away, that we have lost our focus on living for the world above, which is eternal. It is possible to live our lives as though we are no longer here on earth. Everything will change for us if we live with this perspective. We will evaluate our time and the things we choose to do by the importance they have for the eternal world. Jesus lived that way. He said, “For I have come down from heaven, not to do My own will, but the will of Him who sent Me” (John 6:38). Paul too had the same focus. He wrote from prison, “The things which happened to me have actually turned out for the furtherance of the gospel” (Philippians 1:12). When Adoniram Judson went to Burma (Myanmar) as a missionary, he faced unspeakable suffering. He lost his wife and children, spent 17 months in prison being tortured and sick. All his co-workers left him. Yet he would not leave the mission field. When he couldn’t walk, he crawled to hand out Gospel tracts. What kept him going? It was something he saw beyond time. Today the Burmese church credits over a million believers to His life. I want to challenge you to evaluate your present life, whether it has anything to do with the life to come. Christ purposely put the disciples He called into a team so they could follow Him together. Likewise, you need others in the church to survive in this journey, encourage one another and bear each other’s burdens. Ask the Lord to give you continual understanding of the eternal world and His purpose for your life here on earth. It will help you more than you can imagine. Accept the fact that without difficulties, pain and suffering, you cannot become the extension of Christ’s life in this world. In this call to follow the Lord, there is no way for you to survive without the quality of a non-stop prayer life. Keep living with the end in mind. Take a sheet of paper and write down your age. Then add 100 years to your number. This will give you a better perspective. You will realize that there is something far more precious before you than this brief life on earth. My dear friend, the greatest privilege we have on earth is to live now as Jesus lived and have our hearts in the world to come.